This image of a joyful male dancer was prepared with a companion piece of a female figure in identical pose and color scheme (not shown). 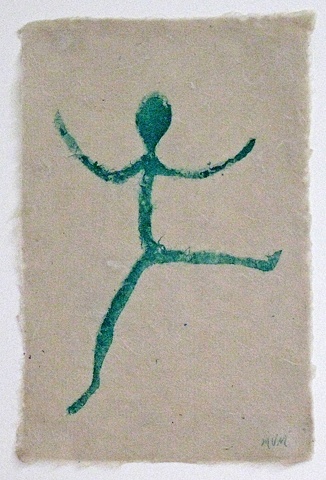 I sprayed pigmented cotton pulp through a stencil onto a base sheet of kozo paper to form the dancer image. Papermaker Andrea Petersen taught me this paper stenciling technique in a 2008 workshop at Paper & Book Intensive, an annual "working sabbatical" for book artists, conservationists, and papermakers.